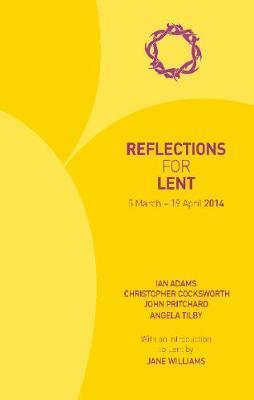 Reflections for Lent is designed to enhance your spiritual journey through the forty days from Ash Wednesday to Holy Saturday (5 March-19 April 2014). Covering Monday to Saturday each week, it offers stimulating and accessible reflections, from four respected Christian authors, on a reading selected from the Common Worship Weekday Lectionary. This volume offers daily material for 5 March to 19 April 2014, taken from the Reflections for Daily Prayer 2013/14 annual edition. It is ideal for individuals and groups seeking Lectionary-based reflections for use during Lent and Holy Week, or for anyone wishing to try Reflections for Daily Prayer before committing to a year's worth of material. It also features a simple form of morning and night prayer and a guide to the reflective reading of scripture. Ideal as an accompaniment to Common Worship: Daily Prayer and Time to Pray, this unique series is for anyone who values both the companionship of daily Bible notes and the structure of the Lectionary. IAN ADAMS is one of the most engaging voices in contemporary Christian spirituality and is the author of 'Cave Refectory Road'. Christopher Cocksworth is the Bishop of Coventry and former principal of Ridley Hall, Cambridge. He served on the Liturgical Commission of the Church of England from 1999 to 2006. John Pritchard is Bishop of Oxford. Angela Tilby is a Canon of Christ Church Oxford.